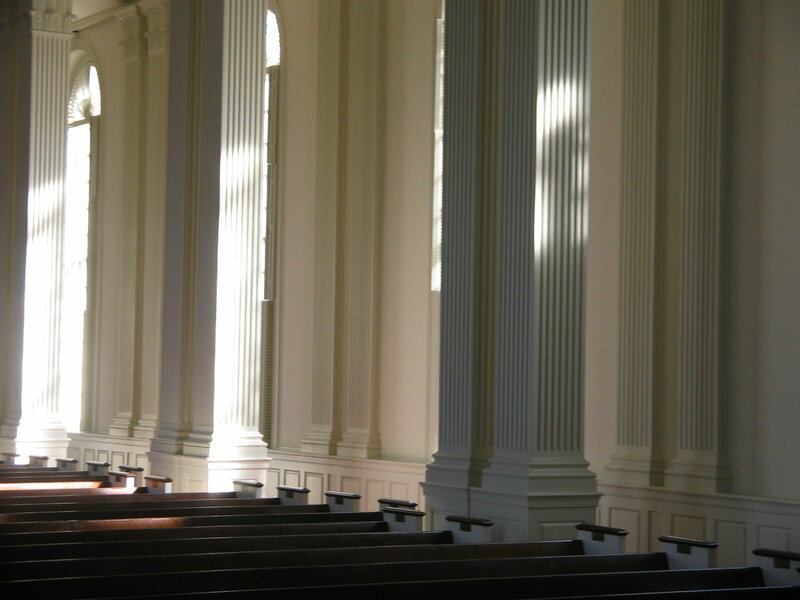 I've always thought of church choirs as small groups, in a way - a community, a fellowship, a place to come together. Choir gives people a place to sing and make music, yes, but also feel safe, be vulnerable, and supportive as we carry one another's burdens. This is one of the reasons why I feel it's important to end each rehearsal with prayer. I grew up singing in a fairly large choir in a Methodist church in Georgia (I say "grew up" because I joined when I was 11!). At the end of each rehearsal, we put down our folders, joined hands, and made a circle around the choir room. We stood there for a few moments, sharing joys and concerns with one another and closing our time together with prayer. It was meaningful to me then and has stayed with me; it's a tradition I've carried with me to all the churches I've served. It's a simple thing, but I believe it makes the difference between choir as a social gathering and choir as a ministry. Prayer reminds us that we have been given an opportunity to serve, we have a purpose, a message to share. It focuses our hearts and minds on the true meaning of our work together. And it gives us an opportunity to carry each other's burdens - to rejoice with those who are rejoicing, walk beside those who are struggling, lift up those who are hurting. Prayer doesn't have to be complicated. This is one of my all-time favorite prayers for church choirs! "Grant that what we sing with our lips we may believe in our hearts, and what we believe in our hearts, we may practice in our lives." Read the full prayer here. Based on Genesis 3:19, Psalm 51:10, and 1 Thessalonians 2:12, this reflective prayer by Laurence Hull Stookey is perfect for Ash Wednesday or the beginning of Lent. "By the redemptive power of the cross, create in us clean hearts and put within us a new spirit, that we may repent of our sins and lead lives worthy of your calling." Read the full prayer here. A prayer for guidance through the wilderness of our lives: "Guide now the people of your church, that, following our Savior, we may walk through the wilderness of this world toward the glory of the world to come." Read the full prayer here. This short prayer reflects on Jesus' willingness to lay down His life for us. "Grant that we may share in his obedience to your will." Read the full prayer here. This prayer reminds us that by grace, through faith, we have been saved. We die with Christ and are raised with Him in new life. "Grant that we, who celebrate the day of our Lord's resurrection, may arise from the death of sin to the life of righteousness." Read the full prayer here. This lovely prayer works well with Psalm 51 ("Create in me a clean heart, O God"), but is fitting for anytime of year. "Give me a pure heart, that I may see thee; a humble heart, that I may hear thee; a heart of love, that I may serve thee; a heart of faith, that I may abide in thee." Read the full prayer here. I love the mission component of this prayer: Show me where there is a need and give me an opportunity to serve others in Your name. "Show me where love and hope and faith are needed, and use me to bring them to those places." Read the full prayer here. A prayer of healing for those who are sick, and for their caretakers: "[That they]may find help in weakness and have confidence in Your loving care." Read the full prayer here. The well-known prayer of St. Francis (though likely not actually written by St. Francis) is a prayer for peace and a call to service. "Lord, make me an instrument of thy peace. Where there is hatred, let me sow love; where there is injury, pardon; where there is doubt, faith." Read the full prayer here. A passionate prayer for boldness to proclaim God's message throughout the earth: "Fill your church with power, kindle flaming hearts within us, and cause us to proclaim your mighty works in every tongue." Read the full prayer here. A beautiful prayer of surrender and trust: "Let me be employed for you, or laid aside for you, exalted for you, or brought low for you; let me be full, let me be empty, let me have all things, let me have nothing." Read the full prayer here. Read (or sing!) a verse of a prayerful hymn, like "For the Beauty of the Earth," "Take My Life and Let It Be," "This Is My Song" (vs. 3) or "O Little Town of Bethlehem" (vs. 4). You might also consider more modern hymns by Andrew Pratt, available here. If you have an anthem that is fitting, read the text as a closing prayer at the end of rehearsal. And of course, if you have others in the group that are willing, ask if they'd lead the group in prayer one night. Or, read this prayer, written by a choir member for her choir. The Book of Common Prayer, Lutheran Book of Worship, and even your hymnal are all great resources! Looking for more? 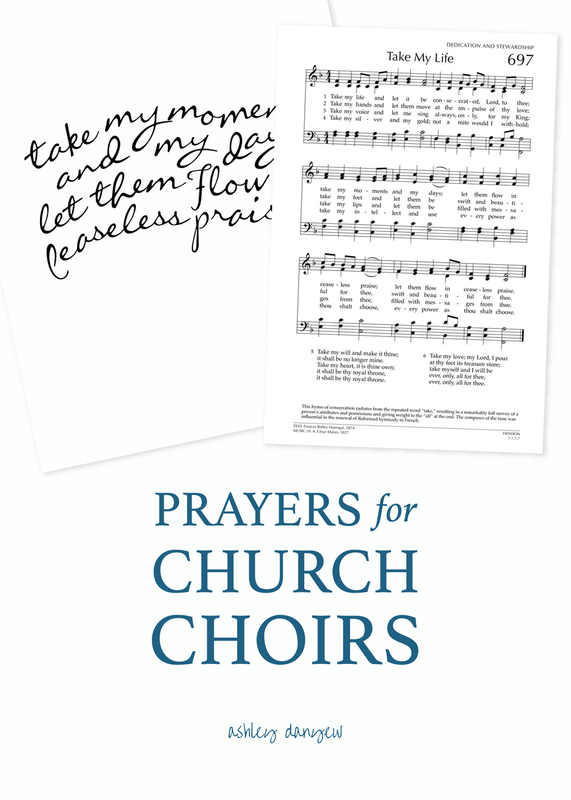 Take a look at this new Prayers for Choirs series. Do you pray with your church choir? Why or why not?